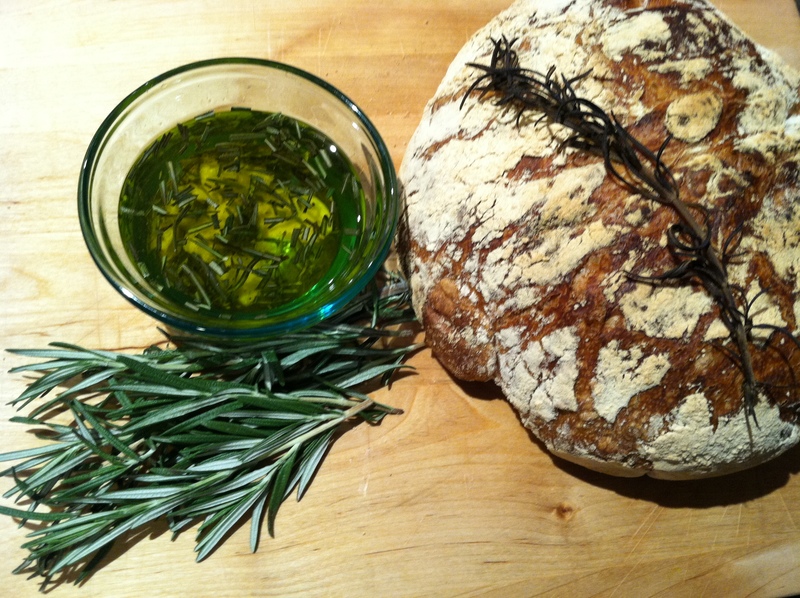 This is my second time I have baked bread, so I decided to make a delicious dipping oil to compliment the bread. Since I added fresh rosemary to the bread (recipe posted on blog under “Boule” bread) I thought a rosemary garlic oil would be great to dip pieces of the warm bread into. I recommend you make this several hours before you plan on eating it since the flavors are enhanced with time. Take a small bowl and add the olive oil. Take two cloves of garlic, peel them and with the back of a large knife, place the flat side on one clove and with your hand smash down onto the knife to crack the garlic. This releases all the great flavor. Place it into the olive oil. Continue with the second piece of garlic. Finely chop the rosemary and place it into the oil. By chopping the rosemary, you are releasing the oils and fragrance. Last, add the salt and pepper. carefully mix all the ingredients and enjoy! Thank you! Actually, this was the second loaf of bread I have ever baked! It’s so easy to make, just have to be patient with the wait.